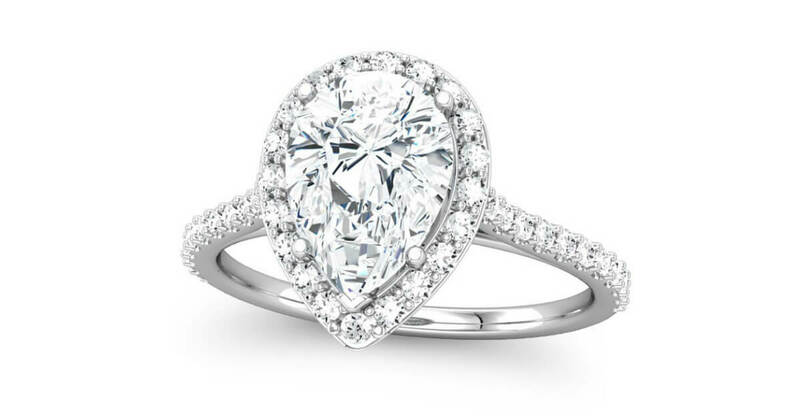 Also known as the “teardrop diamond”, the pear cut is essentially a mix of a marquise diamond and a round brilliant. This modified brilliant cut features one rounded end and an opposite point, which always is worn pointing down towards the fingernail. While the pear cut is not as popular as cuts like a princess or round brilliant, it does provide a great option for a bride that is looking for a less traditional stone. The pear cut diamond was originally created by Lodewyk van Berquem of Belgium in the early 1400’s. In addition to creating the pear cut, van Berquem was also responsible for the placement of facets in modern diamond cuts, as well as the use of symmetry in diamond cutting. As an accomplished diamond polisher, van Berquem was officially credited with creating a diamond polishing machine called the “Scaif.” This was a revolutionary invention for the diamond cutting industry, and variations of this tool are still used by diamond cutters today! The pear cut diamond exclusively uses either 71 or 58 triangle shaped facets. Unfortunately, when the stone was introduced it was not popular. The cutting process causes a great deal of the rough diamond to be lost when creating the pear shape, which made it less desirable for diamond cutters at the time. Much like other modified brilliant cuts, the facet placement on the pear cut allows for more forgiveness in how well inclusions can be found by the naked eye. This is much different than diamonds with less facets like the asscher cut or emerald cut, where inclusions are extremely exposed. Many times, finger shape plays a large role in what type of diamond cut a bride-to-be chooses. The pear cut’s tapered point causes the ring finger to look elongated and slim. Because of the pointed shape at the bottom of a pear cut diamond, chipping is a major concern. Be sure to select a setting that uses a prong to protect the point. Due to the way a pear shaped diamond is cut, inclusions and variances in the facets tend to be found at the point. Fortunately, a setting with a prong at the tip will hide these inclusions very effectively. The pear cut diamond is a unique cut that was originally created in the early 1400’s. Its characteristics as a modified brilliant diamond make it excellent for masking inclusions, but care must be taken to select a setting that protects the diamond from chipping.